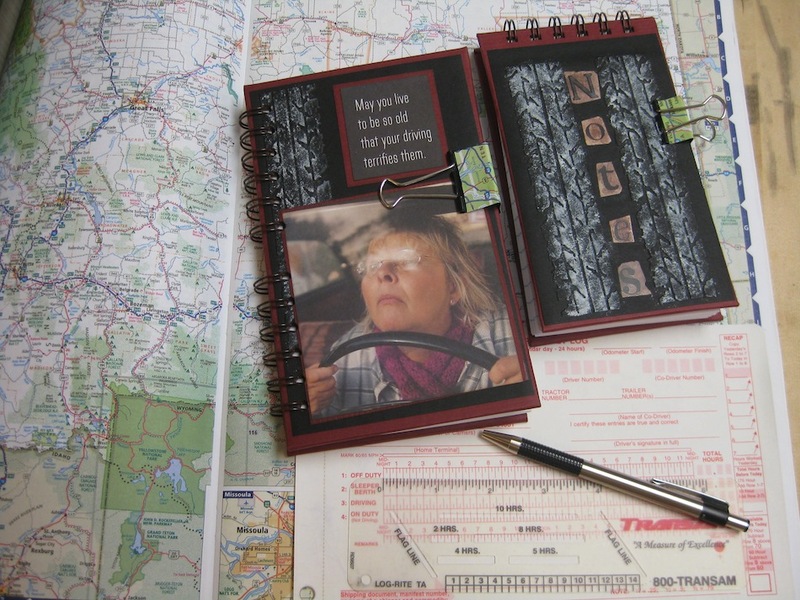 Masculine Mileage Journal and Note Pad set. 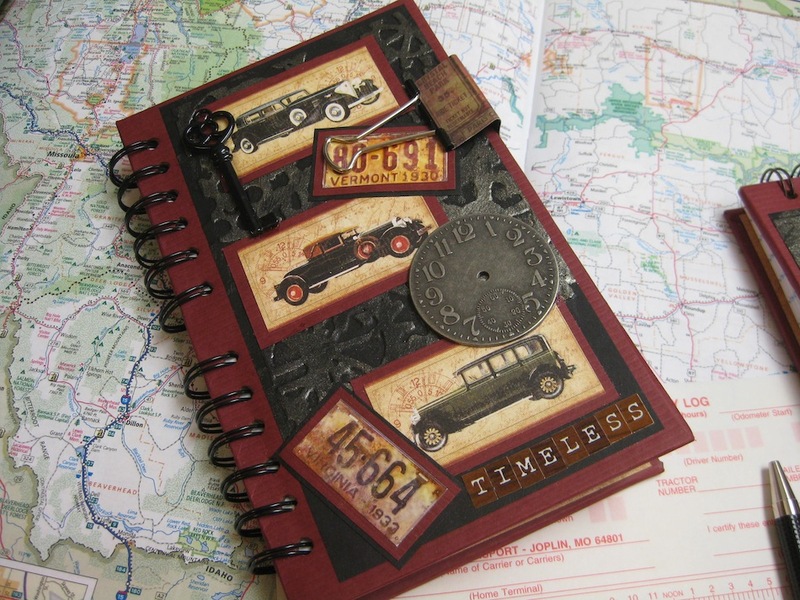 Tim Holtz and Graphic 45 were the inspiration for this masculine Mileage Journal and Note Pad set. The background embossing is from Tim Holtz Alterations “Gears”. 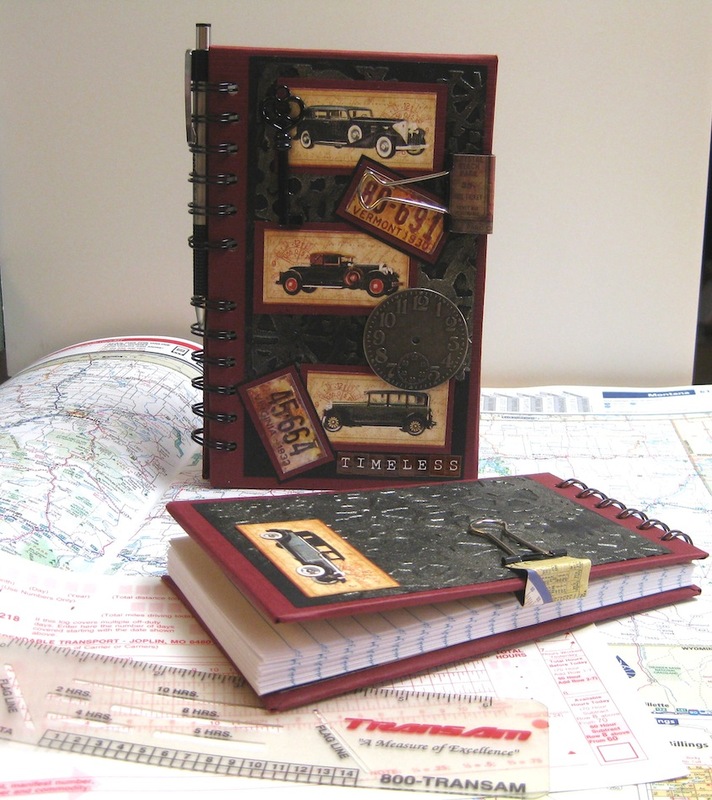 The old cars on this book are from Graphic 45’s “A Proper Gentleman” paper pad. The old license plates are from Tim Holtz “Lost and Found”. The covers of each of these hand crafted books are made using heavy weight corrugated cardboard and quality bookbinding glue. 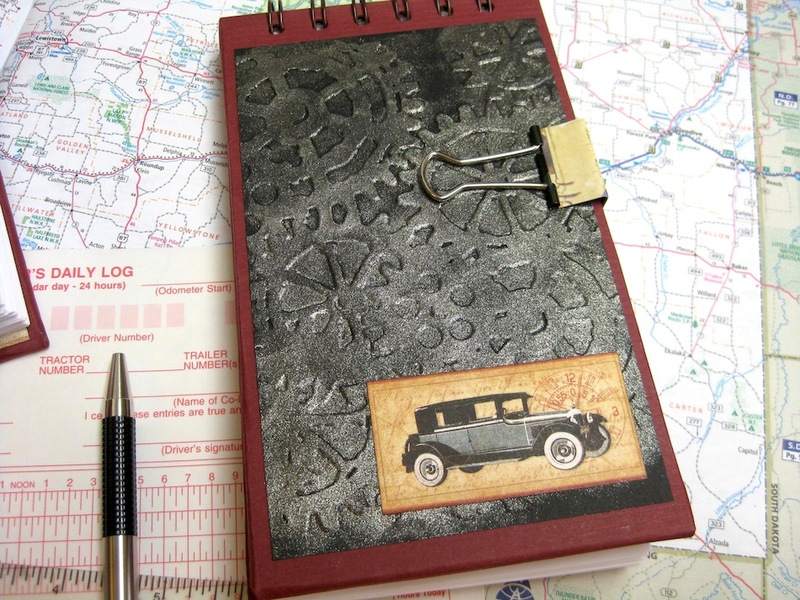 I have attached a Tim Holtz metal clock face and an old style skeleton key to the front of the Mileage Journal. Each have been secured using E6000 adhesive for a strong hold. This set can be found at my Etsy store if you are interested in having this three piece set. The set includes the Mileage Journal, coordinating Note Pad, and a pen. Each book has a binder clip to hold your place. 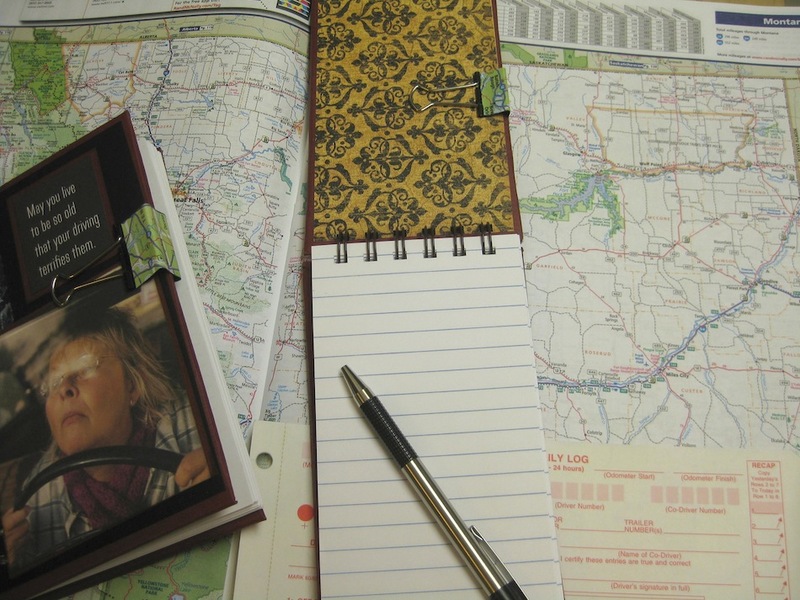 Chuck the Mileage Journal onto the dashboard of the truck and have no worries about losing your place. Keep the page in the Note Pad easy to get to if you have to follow hand written directions to the pick up or delivery location. This set of journals have areas to write all of the necessary information for each load in the Drive-Away trucking industry. This set was a little on the difficult side to create. I was sorely tempted to keep adding stuff to the covers. Keeping them simple almost didn’t happen ;-). This will be my first offering on Etsy at Message In A Fold. This set consists of three (3) items for a cost of $25.00 plus an approximate shipping charge of $9. Approximate because it may be less depending on the size of box needed to ship the items. 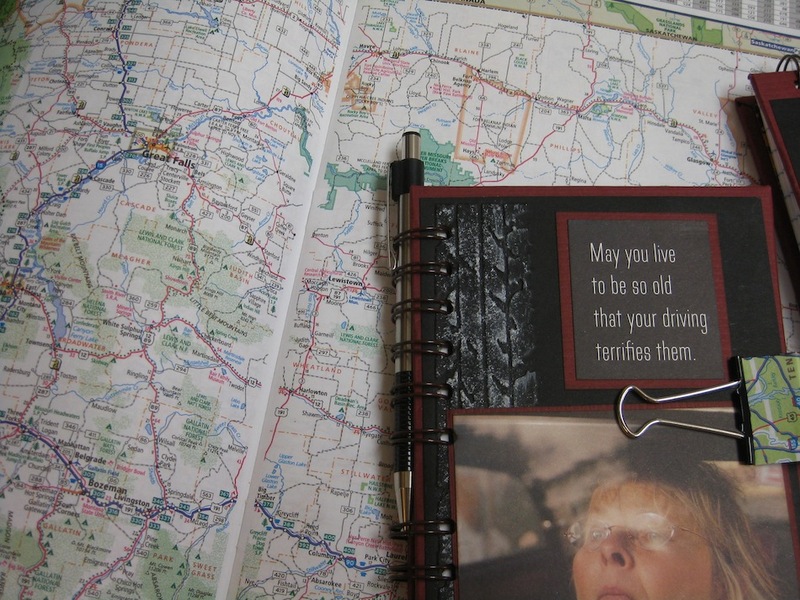 One Mileage journal with a binder clip to hold your place, one matching note pad with binder clip, and one pen. The pen is thin enough to be stored in the binding so it doesn’t get lost. I am in the process of making three more journal sets and will have them up on Etsy in the coming weeks. I will also have a more definite shipping charge for these sets. Each of these books are hand crafted from heavy weight card stock and thick cardboard. The glue used on these covers is a high quality book binding and laminating adhesive. The covers have been under pressure to strengthen the bond of paper to cardboard during the curing process. The note pad will fit in a shirt pocket. Sweat will not damage the covers. Joe carries his around in his shirt pocket all the time and he can get pretty sweaty at times. These books have been made to be rugged to withstand sunlight and heat while resting on the dashboard of a truck. These books will maintain their shape when being shoved into a tote or briefcase. They are sturdy enough to have open over the steering wheel as you make note of the odometer reading while crossing over state lines. These journals will not bend and fold under the pressure as the standard lined note books sold at truck stops everywhere do. The note pad has been designed so you can use both sides of the lined paper. The front cover flips over easily for you to write on the back side of the paper while making your notes. Doodle away while you wait in a restaurant for your meal to arrive. 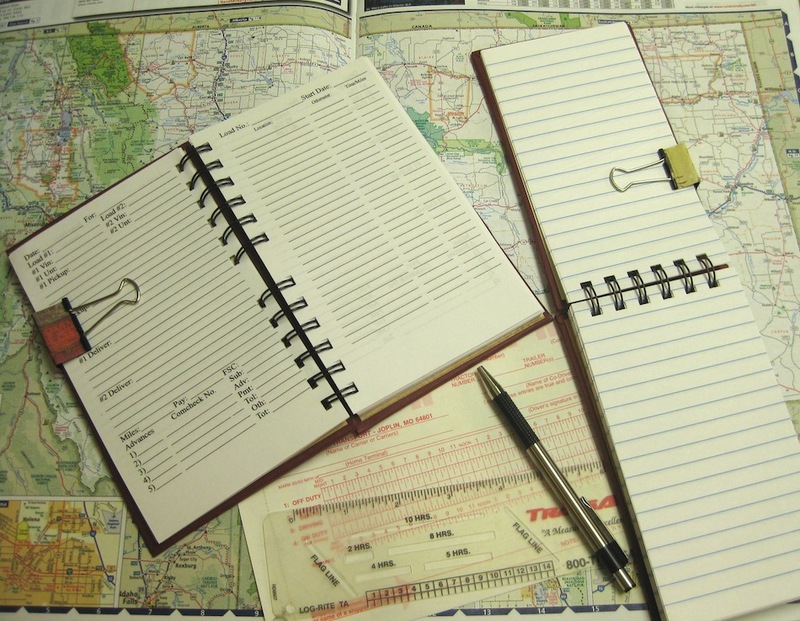 Use the note pad as a ledger to track your expenses on your trip. 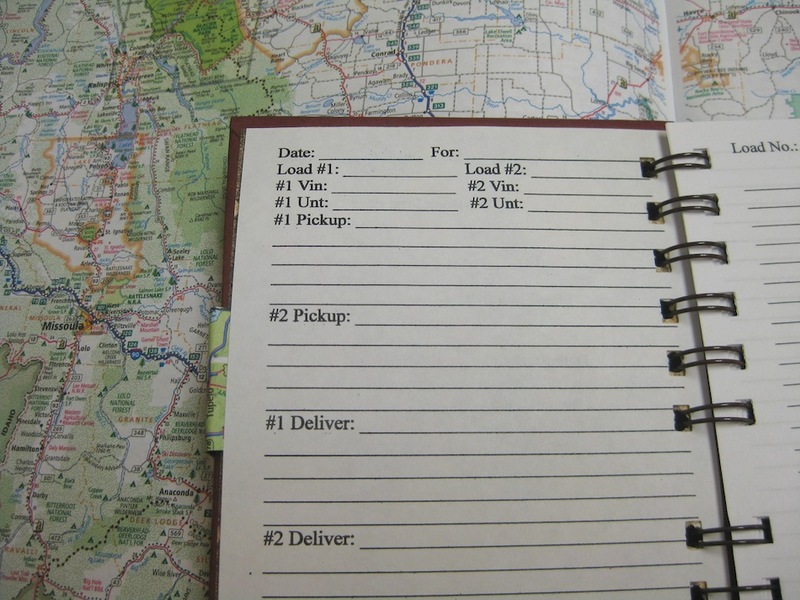 Write down verbal directions to a pick up or delivery site. The binder clip will hold the page secure so all you need do is flip the book open to follow the directions given. 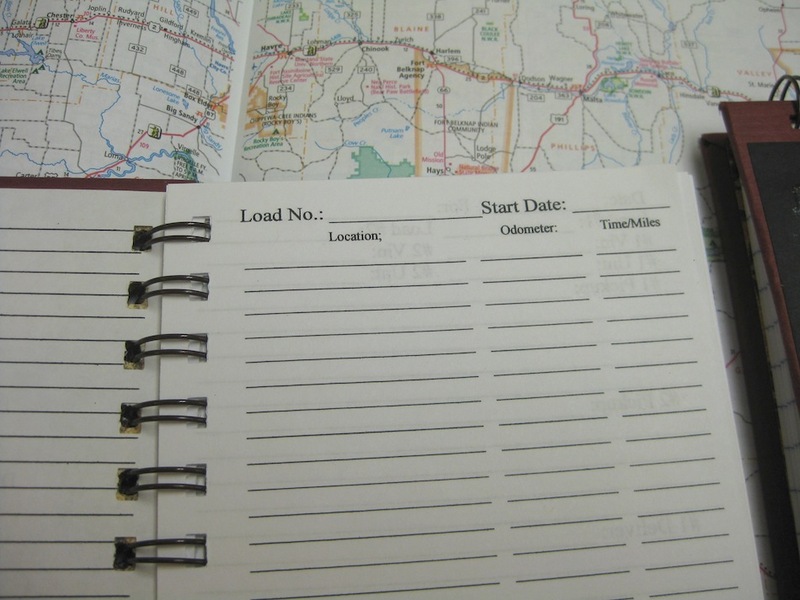 The Mileage Journal has 80 pages for approximately 160 loads. The note pad has 100 sheets of lined paper for 200 pages of notes. If you may be interested in having a set featuring your favorite sport team or theme, a favorite hobby….you’d rather be fishing ;-)…or playing golf. I can accommodate nearly anything you wish. Paper selection and availability will be the only concern. Leave a comment and let me know if you have any requests.